The first lesson on So What Chords provided an introduction to the voicing. We covered how the voicing is constructed and then we looked at the different ways that we can incorporate the voicing into the tunes we are playing. We then looked at slide slipping where you play neighbouring So What chords in close succession and also talked about reharmonising entire melodies using So What chords — if this all sounds new to you I would recommend checking out that lesson. In this lesson, we are going to explore So What Chords further and you will learn how you can use these voicings not just for minor chords but also for major chords. Using So What Chords in place of Major chords might sound strange as we know that So What Chords are minor in tonality so how can they be used in place of a major chord? The answer is because the so what chord can function as a rootless voicing for the major chord. So What Chords can be used on major chords that contain the major 7th in the melody. Here is a Cmaj7 chord and you can see that the 7th of the chord is in the melody. The rule for major chords is to play a So What chord off the major third. So for a Cmaj7 chord with the 7th in the melody we could play an E So What Chord. If we analyse the scale degrees of the So What chord in terms of C major, from bottom to top we have the 3rd, 6th, 9th, 5th and 7th . Notice that the E So What Chord contains both the 3rd and 7th of Cmaj7 — the 3rd and 7th are the two most important tones of the chord which is one of the reasons why the so what chord sounds so good. We can also play this chord with the root which can be included in your left hand. The So What Chord creates a stack of 4ths in the middle of the chord which gives the voicing and very modern and contemporary sound — another reason that makes it sound great. We explore the voicing options for major chords under each note of the Lydian Mode which is a common scale to play over major chords. 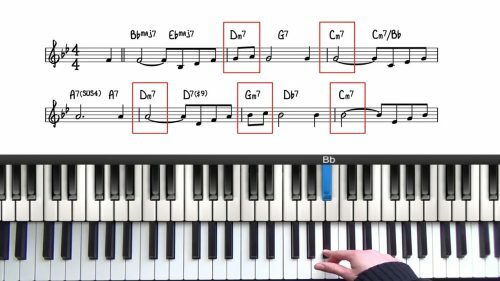 Flick through your fake book or the jazz standards you are working from and look out for major chords with the major 7th in the melody. Once you have found an example, build a so what chord off the major 3rd and you will then be playing the major so what variation. Always remember that you will remember the theory much better when you spend the time to work this out yourself.